The First and Second World Wars brought enormous changes to Canadian women’s lives. They adapted to the conditions of total war in practical terms – working, volunteering and serving in uniform. In the wake of war’s inevitable tragedies, they also faced other challenges. The contributions made by women to the Canadian war efforts were crucial, and their experiences forged a new understanding of women’s capabilities both within themselves and within society. Through artifacts, images, audiovisual material, oral history and text, World War Women delves into the personal stories of the women associated with these materials. It is organized in stand-alone thematic zones, each devoted to an element of the wars that particularly involved and affected women. An exhibition developed by the Canadian War Museum, Ottawa. During the First World War, to raise money for prisoners of war, the Ottawa Women’s Canadian Club sold souvenirs made from the debris of the Centre Block of the Parliament Buildings, which had burned down in 1916. During the Second World War, women could purchase pattern books that they could use to knit items for military personnel, including amputation covers. Women and girls — some as young as 11 years of age — sold 25-cent War Savings Stamps on behalf of the federal government during the Second World War. By the end of the program, they had raised $318 million. More than 50,000 women served with the Canadian Armed Forces during the two World Wars. Molly Lamb Bobak was the only female Canadian official war artist sent overseas during the Second World War. She went on to be one of Canada’s most celebrated war artists. 3,000 nurses served in the armed forces, and 2,504 were sent overseas with the Canadian Army Medical Corps during the First World War. Canadian nurses were accorded officer status to discourage fraternization and give them authority over patients. During the Second World War, even with a pilot’s licence, women in the Royal Canadian Air Force-Women’s Division were not permitted to fly. In 1942, the Canadian Women’s Army Corps established the first all-female military pipe band. During the Second World War, more than 300,000 Canadian women held jobs related to war production. In 1942, more than 100 contestants from Canada’s major military manufacturing plants vied for the title of “Miss War Worker.” The winner, Dorothy Linham, starred in a Palmolive Soap advertisement. At the end of the Second World War, only three of the 3,000 women employed at the Canadian Car and Foundry plant kept their jobs. During the two World Wars, approximately 100,000 Silver Crosses were given to the mothers and wives of soldiers who were killed. 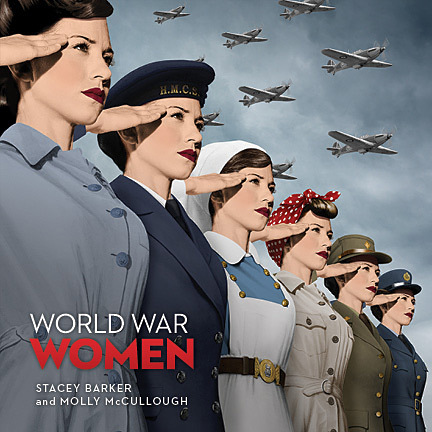 Complete your visit by picking up the World War Women souvenir catalogue, on sale online and at the Museum Boutique. H.Col (Ret’d) John C. Eaton, O.Ont., K.St.J., D.Com. and H.Col Sally Horsfall Eaton, S.S.St.J., C.D., R.N., LL.D.